Cars and bikes used to be our favorite toys to play with when we were kids. As we grow old these things adapt a more practical approach in our daily lives. Most of us love driving, I fell that it’s an adventure, especially for boys. Learning how to ride bicycle has to be the most amazing memory of childhood. However, when we grew older bicycles were replaced by motorbikes or gearless scooters. In India it’s illegal to ride any vehicle without a driving license (DL) many youngsters are booked for the same, so it’s necessary to get a DL. The process is simple yet tiring, first we need to apply for a learner’s license before we apply for a permanent driving license. In the last article we learned how to apply for Learners License online. If you have got a learners license already then this article is for you. Cars and bikes used to be our favorite toys to play with when we were kids. As we grow old these things adapt a more practical approach in our daily lives. Most of us love driving, I fell that it’s an adventure, especially for boys. Learning how to ride bicycle has to be the most amazing memory of childhood. However, when we grew older bicycles were replaced by motorbikes or gearless scooters. In India it’s illegal to ride any vehicle without a driving license (DL) many youngsters are booked for the same, so it’s necessary to get a DL. The process is simple yet tiring, first we need to apply for a learner’s license before we apply for a permanent driving license. In the last article we learned how to apply for Learners License online. If you have got a learners license already then this article is for you. Once you get the LL, you will be eligible to apply for a Permanent Driving License after one month. Note than the validity of the LL is only up to six months. Let’s check out the process to apply for Permanent Driving License in the following article. 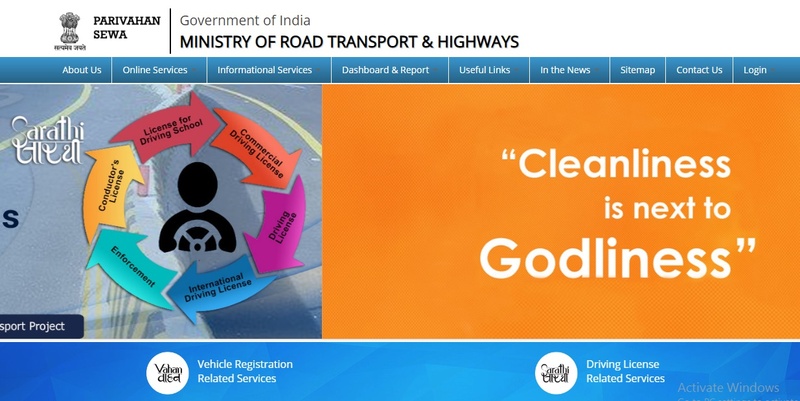 The Ministry of Road Transport and Highways have made the process of applying a bit easier by going online as a part of digital India. Now, we can apply for a Permanent Driving License for 2-wheeler and 4-wheeler online by just a few clicks. 2. On the home page click on Driving License Related Services. 3. A new window will open officially known as the SARATHI Services. It will ask you to select the state you belong to and the closest Regional Transport Office where you will need to visit later. Select as per your liking. 4. On the next window Click on Apply Online, then click on New Driving License in the dropdown menu. 5. The next window will show the steps for filling the application form. Click on Continue. 6. The next page will ask you to fill details about the Learners License that you have such as learners’ license number and DOB. Fill those details and click on continue. 7. The system will fetch your details as per the Learners license. If it asks you to fill other details such as DOB, Permanent Address, etc fill those. (Note: You must also select for what vehicle you need the Driving License). After filling the application form Save it and click on Next. You will be provided with a application no. save it for further use. 8. The next step is uploading the documents. The documents you will need are Permanent Address Proof such as Passport or Aadhar Card and Age Proof. 9. Next step is uploading your Photo and Signature. Make sure your passport size photo is recent. 11. The final step is the making the payment. The charges may vary according to your vehicle. On the day of your DL test, arrive half an hour before your timings at the RTO. You will have to carry certain documents along. •	Medical Certificate FORM 1- It can be downloaded from the SARATHI Services. •	Photocopy of Age Proof and Address Proof such as Passport or Aadhar Card. •	DL Slot appointment application. Next, you will have to go on a window for the scrutiny of your documents. After this, the officials will send you to another room to click your photograph and note your biometric signature. In the same room you will also have to give the Driving Test on the Simulator. The Simulator has all the parts of the car; it’s just that it’s type of a video game on a screen. This test is of 100 points and you have to score above 60 to pass it. If you fail you can come for a retest after one week at a cost of 250Rs. If you pass then your papers are ready for the final submission. The officials will send you to another window and there they will ask you to drive your car or motorbike just a little. It is most likely that you will qualify for the DL. After this, submit your papers to the window where you first did the scrutiny, Your job here is done. The DL will arrive by post at you home within 15 days. What to do on DL Test day? How to install the Windows 10 April Update successfully without any problem?